Since its inception, Hola has rapidly established its position as one of the world’s leading VPN services, offering a range of powerful benefits developed specifically for better user experience. Brainchild of Hola CEO Ofer Vilenski & CTO Derry Shribman, the service now boasts over 31 million users, spanning the globe. The Hola web service offers a number of exciting features, which have been created to change the way the worldwide online community uses the internet. 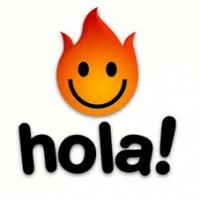 Unlike traditional VPN’s the Hola web application speeds up internet access by using the services ‘social routing’ approach which caches content with peers. This approach avoids the conventional traffic congestion and slow server response times associated with online instability, to speed up content viewing, it also allows us to offer the service for FREE as there are no costs associated with servers. The service also offers powerful online security and anonymity by protecting against ISP tracking, shielding computers from hacking and super-charging ‘incognito’ browser functions. Striving to ‘liberate’ the internet, the Hola service also opens up access to content which is otherwise unavailable due to geographical restrictions. The Hola VPN provides user with a means to overcome a range of censorship issues such as company intranet, government site blocking.